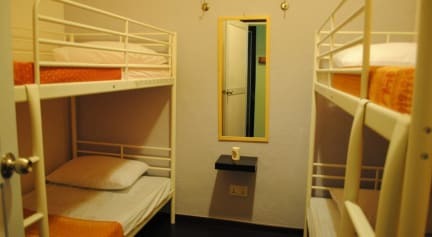 Hostel @ 38 Hong Kong Street, formerly known as Rucksack inn @ Hong Kong Street is ideally located within the city's business and entertainment district, accessibility to Chinatown district of a 8-minute walk; surrounded with various shopping, dining and entertainment venues. Close to major places of interest like Orchard Road, Merlion Park and the numerous bars and restaurants on the famous Clarke Quay and Boat Quay, the hostel is just a 3-minutes’ walk toward MRT and bus station, a 45-minutes’ travel time via MRT and 30-minute drive from Singapore Changi Airport. 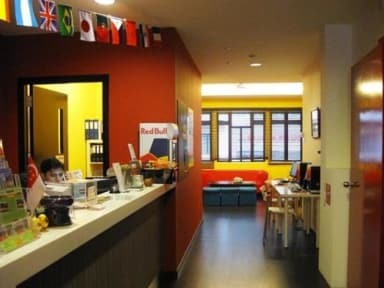 Hostel @ 38 Hong Kong Street offers modern accommodations in Singapore. All rooms are fitted with air conditioning, international plug sockets, fresh linens and bedding. Toiletries such as shower gel, shampoo and hot water shower are also provided to our guest. Toilets and Bathrooms are shared. Computer stations are available for guests to use at the common area and a simple all-day breakfast of coffee, tea and toast can be found at the shared pantry. The hostel also offers complimentary Wi-Fi access in the entire hostel. Discounted tickets for most attractions are available for sale at the property, while laundry services can also be requested. Luggage can be stored with no extra charge. Nice place close to Chinatown and transport. Beds are comfortable. Stayed in a double private room with my girlfriend - The staff were great - friendly and helpful. Showers and toilets were clean and worked. Room had air conditioning. Location was good, in Singapore it's easy to get around on public transport from there. The breakfast area was nice and they had enough bread to have toast with jam and they had coffee sachets. They have a cosy shared seating area with sofas and TV and a couple guitars. The room is just enough for you to get some comfortable sleep. We took the one with two double decks. If you only need a place to sleep after some strolling, this place is the best choice. Area is near Clarke Quay and around 15 minites walk to the Merlion Park. The airconditioning in the hallways are a great respite from the Singapore heat! I just stayed for 1 night, I didn't have time to review every topics, but its a nice hostel, ok about the room, the toilets, they offer a good breakfast, good location, you can go by walk to Chinatown, Marina Bay Sands, to the museums, to the boat and Clark Quey. I would book this hostel again, for sure. My stay was too short to have a representative review. For one night it was ok. No staff late night so I had to check myself inn. great location, decent price. not much atmosphere. there was air con but it was still pretty boiling. Good value, lovely staff and excellent location but poor facilities and no atmosphere. A bit grubby too. No electricity in the girls dorm, lie in information say it will return in 1h but 3 day after still no electricity.I had to wait one day before they accept to move myself in another room with electricity, so charge my stuffs was impossible. The toilets are dirty and don't work well. No hot water after midnight in the shower. No key on the rooms, anybody can enter and steal, any security. Guys was sleeping in the common area sofas so impossibility to use the space. Expensive for the low quality.